Today, when you order "Table Hopping Cups and Balls with Carl Andrews", you'll instantly be emailed a Penguin Magic gift certificate. You can spend it on anything you like at Penguin, just like cash. Just complete your order as normal, and within seconds you'll get an email with your gift certificate. Table Hopping Cups and Balls with Carl Andrews (DVD) Perform the PROFESSIONAL cups and balls routine that will get you HUGE REACTIONS at parties, in restaurants, and on the streets!!! Highly Recommended! Order in the next 5 hours 57 minutes and it will ship TODAY! After working restaurants for over 20 years, Carl discovered that 3 cups are just one too many. A single cup isn't interesting enough, but two cups is just right. 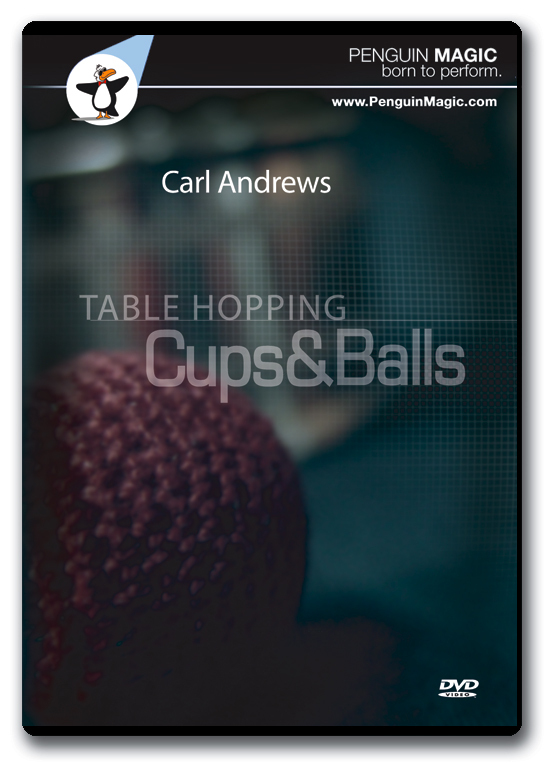 As you�ll see, Carl Andrews' Table Hopping Cups and Balls is a 2-cup routine that travels light but is full of laughs and surprises. You start by making the balls vanish and then reappear � instantly � beneath the cups. Next, the balls travel through the cups, then in one of the most magical phases, one ball appears magically on top of the cup�in full view! Then come a series of lighting quick vanishes and reappearances climaxing in the revelation of the final loads � spongeballs! Carl uses these balls right afterwards in his signature Ain�t No Mo spongeball routine (also explained). Due to the construction of the routine, you can perform Carl�s Table Hopping Cups and Balls without a jacket, and the routine is completely angle proof. This DVD features both live and in-studio performances plus multiple angle explanations. I was a little shocked at some of the negative reviews I saw for this. This is not a tutorial or encyclopedia of C&B moves. This is a workers routine, and a pretty strong one. This is for someone who knows basic moves already. In fact the moves in this routine are about as basic as in any dime store magic kit. This is for someone who is looking to save a little space in their bag by carrying a smaller number of cups, and doesn't want to put together their own routine, which can take weeks to put together a good routine, script it, and rehearse it. This is a good, solid 3-6 minute routine with all of that leg work done for you. As an added bonus his sponge ball routine, Ain't No Moe, is also taught on this DVD. If you're looking for move tutorial stick to Ammars DVD set. But if your looking to push past just being a move monkey and looking for a good routine to base off of, having the novelty of using two cups instead of three with a good transition into a sponge ball routine, this is a good DVD to reference. Nothing new here, but Carl does a very nice job routining a variety of moves into a commercial two cup routine that uses sponge balls as the final loads. Nice idea, although I'm not a fan of sponge balls. If you are, this is a nice lead-in to a sponge ball routine and Carl offers several nice subtleties in loading two balls that look extremely fair. I have used portions of Carl's thinking into my two cup routine and it has added two strong applause points. Worth checking out if you table hop and are looking for another approach to the two cups. That said, you DO need a bit of table space to have effective blocking and misdirection, so if you're cramped on performing space, this isn't the routine for you. great table hopping routine. Would recommend it highly!! This dvd has good modern production qualities: clear, clean,camera and sound work of both the performer's view and the audience view. 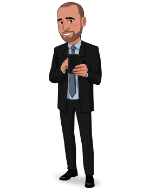 The teaching - demonstrating and explaining - is very good by Carl...I am at ease with his looks and his voice: he looks and sounds 'solid', trustworthy...and what he says is comprehensive and, when needed, specific. Be alert, this dvd is about 'Table Hopping' cups and balls (c&b)...it's all about how and why Carl has adapted the basic c&b to a mobile work space. It is NOT particularly about the basics of c&b: it is more about what equipment to carry, where to carry it and the best conditions/arrangements for performing c&b while on the move in a confined space. For me, it is an excellent addition to to Ammar's comprehensive and detailed ordinary (c&b) dvd. This DVD has allowed me to perform a great 2 cup and ball routine and it is very entertaining and fun. I really enjoyed the several camera angles and the way it was taught step by step allowing me to learn it quickly. I’ve been doing cups and balls in one form or another since I was a kid. This is our first true reworking of the effect. Brilliant handling with a sponge ball kicker. Its a good routine but be aware this is a professional table hoping magicians routine. It is not an introduction to Cup and Ball magic, its not an intro to table hoping. If you go into this familiar with the cups and balls your going to get a great routine for working tables. I have been working with Dia Vernon's cups and balls routine for some time and discovered that it does not do well table hopping. Just prior to this sale, I had been searching for such a routine that I could perform for the patrons of the 99 restaurant when suddenly, like providence it appears.